The first couple of reviews of the 2010 anthology are now out: by Dr. Alistair Dove at Deep Sea News and by Ariel Carpenter at USC News. Check them out. If you have read the book and have a place to publish a review, we’ll appreciate it – just send us the link. I am very excited to announce the Guest Editor for the 2011 – a good friend, a marvelous writer, and a great blogger: Jennifer Ouellette (blog, Twitter). I am looking forward to working with Jennifer over the course of the year to produce the best anthology yet! After five years of self-publishing the book with Lulu.com, the Open Laboratory now has a real publisher! Yes! I am happy to announce that the sixth anthology will be published by Scientific American Books, an imprint of Farrar, Straus and Giroux. Both Scientific American and Farrar, Straus and Giroux are part of the same publishing empire – McMillan – so this is a natural marriage between the two. Jennifer Ouellette and I will work closely with Amanda Moon, Book Editor at Scientific American and Senior Editor at Farrar, Straus and Giroux, on producing the next volume. What does this mean, and what will change? The first phase of the production of the book will remain the same. You will keep submitting your own and other bloggers’ work via the same submission form. I will keep posting the growing list of submissions every Monday morning. At the end of the year, some time in December, we’ll close the submission form as we always do. Jennifer will devise the judging methodology and will ask a group of bloggers, writers and scientists to serves as judges, to help us go through hundreds of entries at a fast pace. Thus the crowdsourced, community aspects of the book will remain intact. Once the final decisions have been made and 50 essays, one cartoon and one poem are chosen for the inclusion in the book, Jennifer, Amanda and I will work closely with the authors to edit, copyedit and proofread the entries until they are in a perfectly publishable form (but without losing the webby ‘feel’). Then the project will get turned over to the professionals for design, typesetting and marketing – the aspects of publishing that were always the hardest for us to do as amateurs until now. Also, though Open Laboratory is a brand in our small circles (and quite popular there – see #openlab hashtag on Twitter), we may need to change its name to something more broadly marketable – but that is far from final yet, more information to come later. This process lasts a little bit longer when done professionally, so we expect the book not to get published early in the year as before, but rather in early Fall, perhaps September, just before people start shopping for the holidays. It took five years to find the publisher for this project, and it has finally happened, mainly due to continuous and strong support of the community – yes, that’s you. And I should not forget to mention the help of people most closely involved in the project over the years – the past Guest Editors Reed Cartwright, Jenny Rohn, Scicurious and Jason G. Goldman, the LaTeX guru Blake Stacey and, person without whom this idea would not have even been hatched – Anton Zuiker. I am very, very happy with these developments and am looking forward to working on it over the next year, and hopefully into the future. The Open Laboratory 2010 – now up for sale! You kept submitting your posts all year long and watching, every Monday, to see which other posts were also entered. Then we closed the submission form. Then we made you wait a month of “electoral silence” while the judges went through three rounds of judging, until we finally announced which 50 essays, plus poems and cartoons, made it into print. Then we announced the gorgeous new cover art. 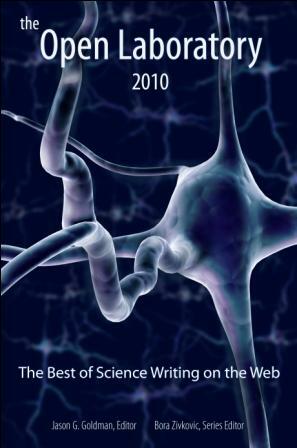 But now – what you have been waiting for so long – The Open Laboratory 2010, the collection of best writing on science blog for the year, is finally up for sale! Thank you Jason Goldman for a fantastic job ushering this project through all year round, to Andrea Kuszewski for the cover design, and to Blake Stacey for doing all the technical stuff with LaTeX and formatting and such. Thank you to all the judges who read hundreds of posts. And thank you to all of you for submitting your posts, spreading the word about the project and supporting it throughout the years. And now…. the brand new Open Lab cover! Designed this year by Andrea Kuszewski! Open Laboratory 2010 – is your post in it? You can now see for yourself! The 50 essays (plus 6 poems and 1 cartoon) have been chosen by a large and energetic panel of judges. I will give the honors to Jason – go to his blog post announcing and linking to all the winning entries to see for yourself. Jason deserves all the traffic and accolades – he worked hard, was efficient and diligent…and he is such a softie! I think he cried about 850 times over the past month as all but the 50 out of 900 entries had to, one by one, get eliminated…. Congrats to all the winners – Jason will be in touch with you shortly about editing and formatting the final version. And it is over! The submission deadline has just passed. No more submissions will be accepted for the 2010 edition of the Open Laboratory. In the meantime, while this process is ongoing, you can use this post, this collection almost 900 links, as a summary of the year, a sample and a cross-section of the best that happened on science blogs over the past twelve months. A snapshot of history! Quite a collection! Open Laboratory 2010 – the final stretch! Posted on November 29, 2010 by Bora Zivkovic | Comments Off on Open Laboratory 2010 – the final stretch! The deadline is November 30th, 2011 at midnight (Pacific time) so you have about one and a half days to dig through your (or other people’s) blog archives including all the way back to December 1st 2009 and pick your best essays, stories, poems, comic strips, cartoons and original art you produced since then. Under the fold are entries so far. The instructions for submitting are here. You can buy the last four annual collections here. You can read Prefaces and Introductions to older editions here. Comments Off on Open Laboratory 2010 – the final stretch!